French President Francois Hollande on Saturday pledged financial and military support for Lebanon and urged politicians to end the political crisis by electing a president as soon as possible, at the start of a regional tour. The Socialist President vowed to step up assistance for Syrian refugees in Lebanon, pledging 50 million euros this year and 100 million euros over the next three years to cope with the humanitarian crisis. Lebanon hosts more than 1 million registered Syrian refugees, a quarter of its population. It has the highest refugee-to-resident population in the world. Lebanese Parliament Speaker Nabih Berri told Hollande that it was necessary “to find a political solution to lift the burden” created by the refugee population on the country. The French leader on Sunday travelled to a refugee camp for Syrians in Lebanon’s eastern Beka'a Valley to speak with families who will be resettled in France. “I just visited a camp the likes of which are all over Lebanon,” Hollande told reporters after spending nearly an hour in the camp. “They (Syrian children) don't want violence. They want to learn and go home, join their families, their country,” he said. Hollande’s Beirut visit, the first stop on a high-profile four day Middle East tour, came just weeks after Saudi Arabia cut $3 billion in military aid to Lebanon, where violence has repeatedly spilled over the border from the brutal Syrian civil war since it began in 2011. 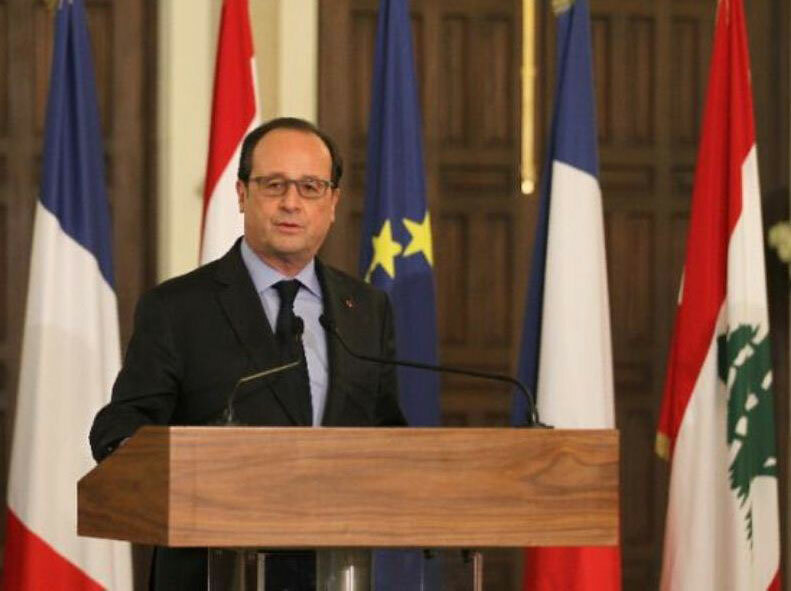 Hollande promised “immediate aid to strengthen Lebanon’s military capacity” to protect its people. “We will work to provide immediate assistance to strengthen the military capability of Lebanon, specifically to combat terrorism but also to confront other threats,” he said after meeting Prime Minister Tammam Salam and Parliament Speaker Berri. Hollande said France’s Defense Minister, who travelled with him, would assess the “material means that can be put at Lebanon’s disposal to ensure its security”, without giving further details. The Lebanese military has recently received additional support from both the United States and Britain as it seeks to defend the porous border with volatile Syria. The army is carefully balanced among the country’s sectarian groups and is widely seen as the backbone of the weak Lebanese state. Saudi Arabia cut aid after the Beirut government failed to condemn an attack on Saudi diplomatic missions in Iran in January, which was prompted by the Saudi execution of a Shi'ite cleric. Riyadh is concerned at the influence wielded by Shi'ite Hezbollah over Lebanese government, and has questioned the Lebanese military’s independence from the Iranian-backed group. It is Hollande’s second visit to Lebanon since 2012. He traveled on to Egypt on Sunday afternoon and then Jordan on Tuesday after his two-day visit to Lebanon.